We’re closing out this week of book reviews with some really awesome reads covering a range of genres. All but one of these books is by an author whose works I’d previously loved; it’s always a relief when a beloved author is able to live up to their own reputation. 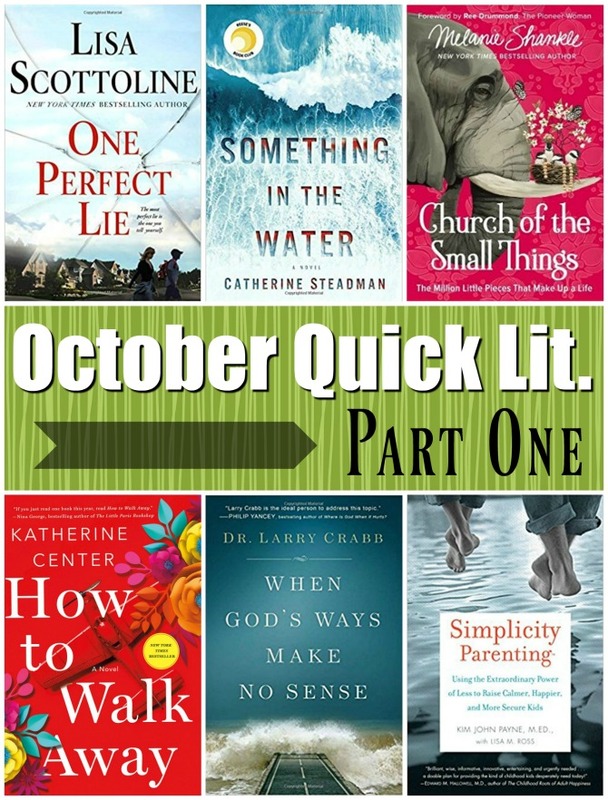 All six of these titles prompted some deep thoughts—to me, that’s the truest mark of a great book! 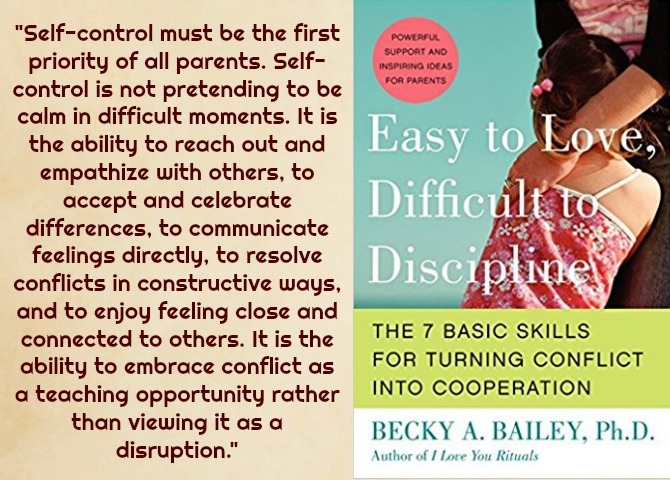 Easy to Love, Hard to Discipline: 7 Basic Skills for Turning Conflict Into Cooperation, by Becky A. Bailey: In my endless quest to become the elusive perfect parent, I’m making an effort to read every discipline book I can get my hands on. Ask me how it’s going. . . . Kidding aside, I have read quite a few discipline books this year and have spotted a trend: after reading, I immediately begin applying the suggested strategies. And they work, for a time. But I grow slack on my implementation, or the strategies begin to lose their effectiveness, and soon we’re back to Ground Zero with a challenging 3-year-old and a mama looking for some new ideas. As frustrating as this cycle can be, I do think it’s good to be getting lots of new perspectives and ideas on discipline, because there’s no one-size-fits-all when it comes to parenting practice; each child and each situation and stage will require something a little different. Continuing to read about parenting also serves to keep me intentional about my own parenting practices and habits. This book is quite different from others in the parenting-help genre in that the author spends just as much time focusing on the parents as on the children. 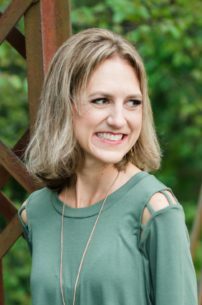 Bailey reminds us that we have to become self-controlled and confident in order to effectively discipline our children, and she shows parents how to focus on OUR behavior and emotions before turning our attention to our kids. She is encouraging and builds parents up rather than just telling us everything we’ve been doing wrong—such a breath of fresh air. Bailey’s framework is built upon the 7 Powers of Self-Control: the powers of Attention, Love, Acceptance, Perception, Intention, Free Will, and Unity. Once we’ve mastered these we can begin to focus on the 7 Basic Discipline Skills: Composure, Assertiveness, Choices, Encouragement, Positive Intent, Empathy, and Consequences. Bailey dedicates a chapter to each of these skills, showing why they are important and using examples to show the sills in action. The last section of the book examines age-specific misbehaviors (I found this extremely insightful and helpful) and gives step-by-step instructions for specific disciplinary challenges. All of these skills are focused on the big picture of helping our kids to develop into compassionate, respectful, and responsible adults. When I began this book I worried that it would be too theoretical and passive to be truly helpful for me and our family. I couldn’t have been more wrong. Bailey tied together a lot of the “work” I’ve been doing for myself (through therapy, journaling, etc.) with discipline. I’m sure I’d noticed this connection before, but I hadn’t been harnessing its potential. Bailey freed me from a lot of the guilt and frustration I’ve had around my son’s behavior by reminding me that he is a free agent; his emotions and behaviors are not a direct commentary on my own parenting practices. That said, she offered a lot of positive strategies to try, and so far they do seem to be working, at least a little. Some are a bit simplistic and won’t work as well in real life as they do in theory (I’m pretty sure the author is not a parent), but the framework itself is great. Most importantly, this book reminded me that my discipline should be focused on instructing Charleston and helping him choose positive behavior; the goal is not to punish him or coerce him into compliance but to make it easier for him to want to behave. And this requires me to be a better version of myself. The calm, authoritative, loving parents described in this book are the type of parent I want to be. I listened through this audiobook twice back-to-back, purchased the Kindle version to make my own highlights, and passed my recommendation on to Luke. For the record, Luke did not like the book; he didn’t care for the book’s format and found the approach too soft (a bit ironic, considering I’m the stricter parent). But I stand by my opinion and would still recommend this to all parents seeking guidance and a new perspective. 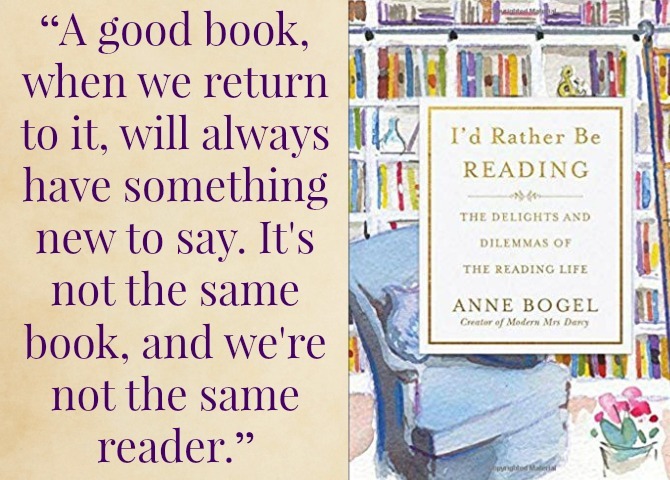 In this collection of 21 essays, Anne shares her recollections on the reading life. For Anne, as for all readers, “books are an essential part of our lives and of our life stories. For us, reading isn’t just a hobby or a pastime; it’s a lifestyle.” Thus, this is her literary memoir. Anne shares how she came to be a reader, the types of readers she has been, how books have shaped her journey, and specific titles that have made a lasting impression. She analyzes her personal reading habits, and her reasons for picking up a book. She also gets into the logistics of reading, from bookworm problems to bookshelf organization. In my favorite essay, she highlights the least celebrated portion of a book (the author’s acknowledgements) and gave me a new appreciation for this section that I admit I frequently skip. Though this is Anne’s personal story, it’s one that will be appreciated by every reader. Our reading life may look different from Anne’s, but we are united in our shared enthusiasm for the written word. This book felt particularly sentimental to me because Anne Bogel has shaped so much of my current literary life. Her recommendations (through her blog and podcast) make up the bulk of what I read these days, and she has inspired me to take my reading life more seriously. 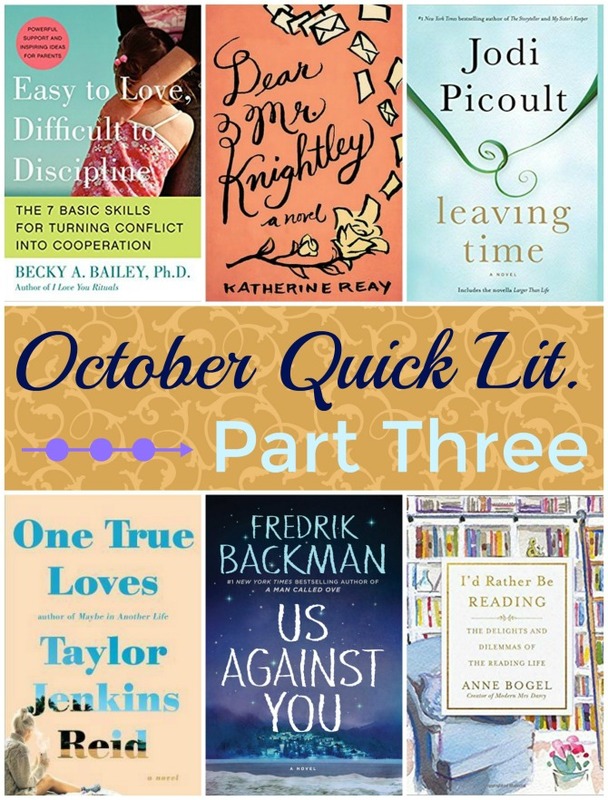 Case in point: these Quick Lit reviews were inspired by Anne’s regular blog series, as are my annual reading challenges. So not only has Anne Bogel fallen in love with books, but she’s helped me (and countless others, I’m sure) do the same. This book is a celebration for all of us! I do most of my reading on Kindle or audiobook these days, but I bought the hardcopy of this one and I’m so glad that I did! It’s an adorable little tome with a printed wrap cover (my favorite). The cover features a watercolor rendering of Anne’s home library; what could be better? This would make a great gift (possibly stocking stuffer?) for every book lover in your life! 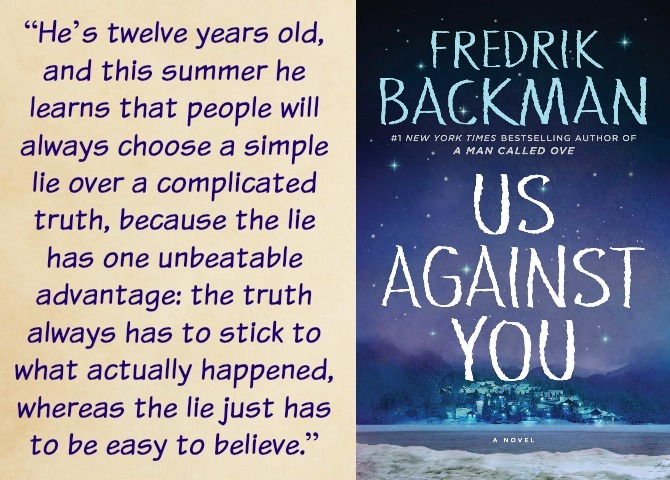 Us Against You, by Fredrik Backman: Fredrick Backman’s Beartown took my breath away when I read it last year. I had zero expectations for the book about a backwoods hockey town (sports aren’t my thing, especially not hockey), but the sports theme was just a vehicle to deliver a riveting story of friendship, tragedy, vices, and virtues. Though that book easily stands alone, Us Against You picks up right where Beartown left off. The crumbling community of Beartown is devastated to learn that their beloved ice hockey team—the heart and soul of the town—may be disbanded. But soon a new team is taking shape, and the rivalry between Beartown hockey and neighboring Hed is fiercer than ever. More than just the team members are at stake: their families, classmates, and even the town’s political structure are all on the line. Because I loved Beartown so much, Us Against You was a bit of a letdown. Don’t get me wrong, Fredrik Backman is an incredible writer, one of the best of our time. (I still find it nearly unbelievable that he is just 37 years old; how can one so young have such a firm grasp on humanity?) The themes here are strong: love, loyalty, courage, the cost of success . . . Backman exquisitely captures the inner workings of each character, subtly blending intimate psychology and philosophy into the broader picture of politics, scandal, and subterfuge. His writing is dark and gritty, yet compassionate and lyrical. He shows AND tells us why a book about sports matters, how hockey is a metaphor for life, and why we should care. That said, this story didn’t capture me in quite the way that Beartown did. While the first book was more personal and relatable, Us Against You takes on a more clinical tone; we are observers rather than participants. The discrepancy is jarring, as though an intimate friend has suddenly grown formal and distant. Perhaps this was intentional, mimicking the emotional distance one experiences as a result of trauma? Whatever the reason, it just didn’t quite work for me. But back to the good parts of this book, for there are many. As always, I appreciated Backman’s intricate plotting and masterful ability to speak into complex social issues. Also, the characters are fantastic—fully fleshed and believably flawed, but not past the point of redemption. I appreciated seeing what happened to each one in the aftermath of Beartown’s tragedy; it’s rare that we are allowed to return to a story (fictional or real) to witness the latter stages of recovery and grief . . . a good reminder that, while the stories we tell have definitive endings, reality moves on—usually in ways that are less than poetic. 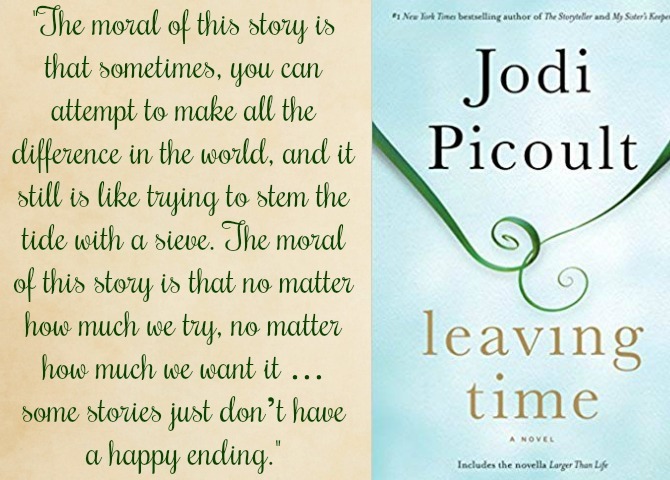 Leaving Time, by Jodi Picoult: It’s been ten years since Jenna Metcalf lost both of her parents in one tragic night. Her mother, Alice, was a researcher whose study focused on grief in elephants. Her father, Thomas, owned an elephant sanctuary where the family also lived. On the night when one of the sanctuary’s employees was trampled to death by an elephant, Jenna’s mother disappeared and her father was admitted to a mental institution where he’s lived since. Jenna has spent the past decade longing for her mother and doing all she could to find her. Jenna’s search leads her to join ranks with a disgraced psychic named Serenity, and Virgil, the detective who has never been the same since his work on the elephant case. Together the three embark on a harrowing journey to locate Alice—a journey that may provide answers none of them is prepared for. The story is told in four voices: Virgil, Serenity, and Jenna narrate the current investigation, while Alice narrates the story of her past—what happened in her years before becoming a mother, and all that occurred in the months and moments leading up to the incident. Alice’s story is framed around her elephant research and we learn a great deal about elephants’ relational habits and, fascinatingly, how similar they are to our own. I had no idea how complex these beautiful creatures are, and found these scientific portions a highlight of the book. We also learn about Serenity’s work within the supernatural world; though this generally isn’t a topic that interests me, it fits well into the story and gave me a lot to think about regarding ghosts and the afterlife. I hadn’t thought I was a Jodi Picoult fan until Small Great Things rocked my world earlier this year. I was eager to read more from Picoult to determine whether that book was an exception, or if she truly was an author I wanted to follow more closely. Leaving Time solidified Picoult as a talented author with an uncanny ability to tap into her readers’ emotions while weaving a complex, gripping story. Her metaphors and psychological insights are captivating, and her characters are incredibly well drawn with unique backgrounds and voices that speak powerfully to universal experiences and truths. I did see the book’s twist ending coming, but it is quite well done and made me want to reread the novel from the beginning to experience the story from this enlightened perspective. This book won’t be for everyone. Grief is a central theme, particularly as it relates to loss between parents and children. As I mentioned above, there is quite a bit of zoological information (which ties well into the story, but may be too clinical for some readers). And I know not everyone will appreciate the supernatural elements. But they made for a great story that I know will stick with me. Shortly after reading this book, I heard Jodi interviewed on this podcast. It was fascinating to hear about her writing process and all the research that goes into her books. If you’re a Picoult fan, you’ll definitely want to listen. 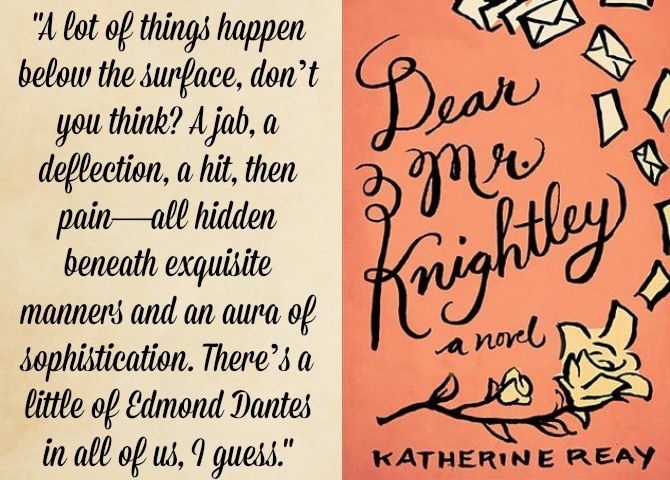 Dear Mr. Knightley, by Katherine Reay: Orphaned at an early age, Samantha Moore experienced years of trauma, homelessness, abuse, and neglect. Books became her escape and she learned to emulate the identities of various characters as a form of self protection. Now that she’s aged out of the foster system and been dismissed from her first post-college job, Sam has decided to take advantage of a grant to study journalism at the prestigious Medill School of Journalism in Chicago. The single requirement is that she write regular update letters to her anonymous benefactor, who has chosen the pseudonym “Mr. Knightley.“ The novel takes an almost exclusively epistolary format, and through Sam’s one-sided correspondence we witness her acceptance into the writing program, the development of new friendships, and—most intriguingly—her budding friendship with renowned crime novelist Alex Powell. As the months pass, Sam begins to develop her writing voice. She also learns a great deal about vulnerability, owning her story, and accepting (and offering) grace. Katherine Reay has quickly become one of my favorite authors; I’ve read all five of her novels this year and this—her first—is my favorite (though Lizzy & Jane is a close second). The premise is straightforward and there is very little plot movement, but I was captivated by the character of Sam and enjoyed watching her mature as a writer and as a person as the book progresses. The love story component is one small part of the book, but it serves as a nice background to the primary narrative that is the inner work taking place within Sam. As a journaler, I’ve always been drawn to epistolary novels, so the format was an easy sell for me (though I’m sure it might not be to everyone’s taste). I also loved the literary references and Sam’s penchant for weaving quotes into her speech. Though it’s an easy read, Sam’s background with the foster care system provides some gritty but compelling content. And her pursuit of a journalism career, as well as her relationship with a successful novelist, offers some intriguing insights into the publishing world. These components keep the novel from straying into “fluff” territory as is common with fan fiction. I adored this book and was challenged by it . . . and I can’t wait for Reay to come out with more for me to love! 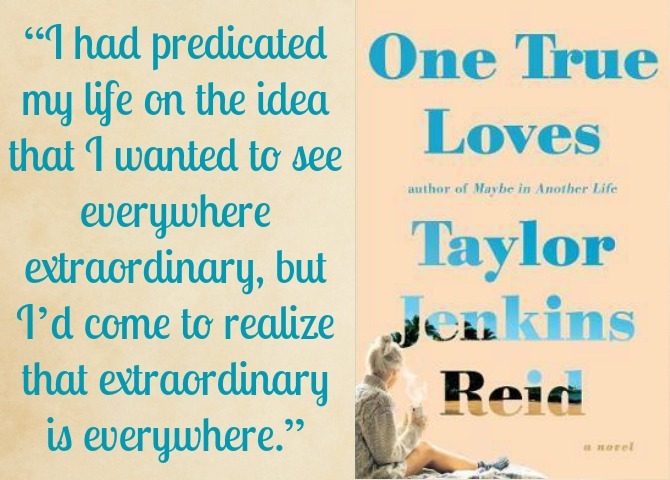 One True Loves, by Taylor Jenkins Reid: One True Loves is essentially the book version of Castaway, written from the perspective of the one left behind. . . Jesse and Emma were high school sweethearts who helped launch each other out of their Massachusetts hometown and the paths paved for them by their parents. After attending college together in California, they went on to travel the world together and eventually married. Then, on their first wedding anniversary, Jesse boarded a helicopter and never came home. The helicopter went down somewhere over the Pacific and its passengers were presumed dead. Three years later, Emma has picked up the pieces of her life and, after a grueling grieving period, moved back home where she’s become the manager of her parents’ bookstore—something she’d always resisted, but now finds to be a good fit. She has also fallen in love with and is engaged to be married to Sam, a friend from her past. What seems like a second chance at happiness comes to an abrupt halt when Emma receives a phone call: Jesse has been found, and he is alive. Now Emma must decide: who is her true love? Is it Jesse, the man she was married to and who held her heart for a decade? Or Sam, the man who has grown to love the more seasoned version of Emma, an Emma that Jesse never got a chance to meet? This is a intriguing twist on the traditional love triangle premise. Through Emma’s experience, Reid explores the fluidity of identity and how internal changes affect our interpersonal lives. How likely are we to change, and is it wrong to expect our loved ones to embrace change within in us? Or is it better to dissolve a relationship once it has run its course and one or both parties are no longer benefiting from the partnership? Reid also examines the concept of true love—does it exist? If so, how is it expressed? If true love IS possible, is it available to everyone? And is it forever? The author and I land at very different conclusions on these issues, but Emma’s story prompted some good internal dialogue for me. One core takeaway was that beauty and growth can be found in the midst of sadness, and are not simply rewards delivered on the other side of a tough time. I also appreciated the reminders about savoring moments as they happen rather than regretting that they will soon be over. Grief is another theme of this book, and the subject is handled with delicacy, compassion, and an understanding that the grieving process looks different for every individual. Given that this hard topic is central to the book, I found the ending to be too tidy. I’m not quite sure what I wanted from the end, but it seemed rather abrupt. I feel like this book had a great concept, and some incredibly powerful passages, but didn’t quite live up to its potential. 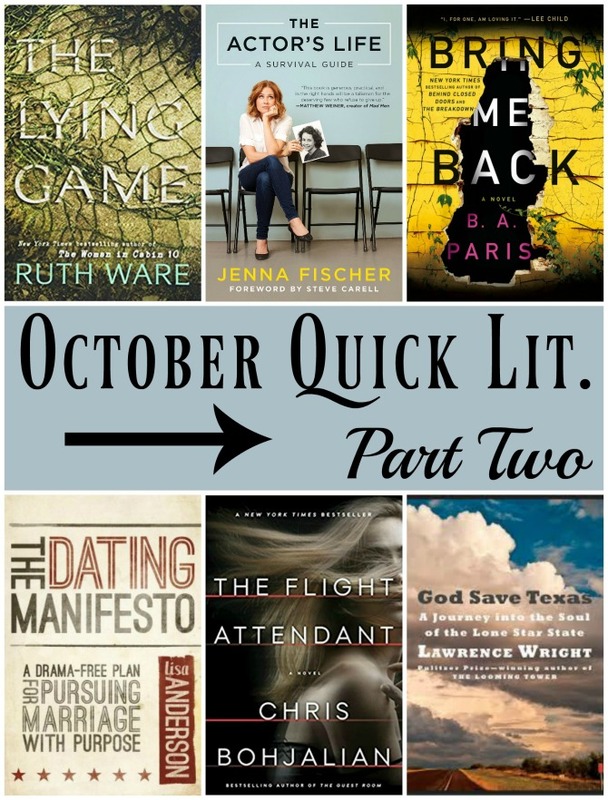 What is the best book (or the worst book) you’ve read this month? Let me know about it!